128 Flying Geese aus lila und Hintergrundfarbe – waaaaaahhhhh! 128 purple and background flying geese – waaaaaaaahhh! Zuerst einmal: Flying Geese sind nicht so meins. Ich kann es nicht erklären, aber ich vermeide sie, wenn es geht. Irgendwie habe ich so eine nicht-erklärbare Abneigung gegen sie. First: I don’t like Flying Geese. I can’t explain, but I try to avoid Geese. Zum Zweiten: 128! Die Menge bei Bonnie haut mich doch immer vom Hocker, wenn ich sie lese. Then: 128! The amount always blows me off when I read it. Ganz frisch und froh habe ich das Schneechaos am Freitag Nachmittag genutzt und losgeschnibbelt. Ich habe nach dieser Methode gearbeitet. Also 32x 4 3/4 inch Quadrate und 128x 2 7/8 inch Quadrate. I use the snow chaos on Friday afternoon and gone cutting. I have worked with this method. So 32x 4 3/4 inch squares and 128x 2 7/8 inch squares. Schritt 1 war ziemlich schnell genäht und gebügelt, dass ich innerlich schon jubelte, Freitag Abend schon fertig zu werden. Tja, meine Jüngste hat der Planung einen Strich durch die Rechnung gemacht. Step 1 was sewn and ironed pretty quickly that I already cheered Friday night to be ready. Well, my youngest girl has made ​​a plan thwarted. Also konnte ich doch erst Samstag alle Gänschen fertig nähen und bügeln. Alles war vorbereitet für einen gemütlichen Film-gleichzeitig-Gänse-auf-richtiges-Maβ-schneiden Samstagabend, da musste ich wieder zu meiner Jüngsten – und bin um eingeschlafen. Um 20 Uhr! On Saturday I could sew all geese and finished ironing. Everything was set for a cozy movie-simultaneously-geese-on-properly-measurement-cut Saturday night, I had to go back to my little girl – and slept. By 20 clock! Sonntag Abend habe ich es dann endlich geschafft! Sunday night I finally made it there! Ich bin gespannt, wie es weitergeht, ich kann mir bis jetzt noch gar nix vorstellen. 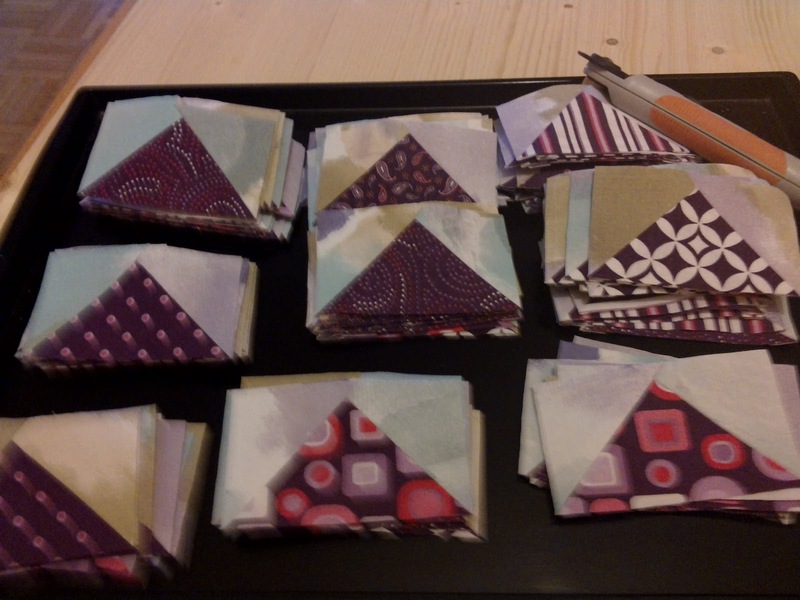 I’m curious to see how it goes on, I still have no idea how the quilt will look like. Oh I love your fabrics! And yeah, the volume of pieces always blows me away, too. I hate geese too. Yours look great. What an early bird! Excellent. Happy Sewing! I enjoy reading your blog in English and German. I don't focus on the big number, and work in little batches. Gradually it gets there. Those are some great looking geese! The number units she asks for freaks me out too! Just keep working! Great work. Great work! Thanks for the smiles! Beautiful colors in your flying geese…they were tough to make but I got it done. Your English is actually quite good, although I like reading the German. It loses something in the translation, I think. Ausgezeichnet! Nice, that you read in german! Where did you learn German? Lovely geese. Wow, you got them done in record time too.